Researchers and communities – a useful checklist for starting a research relationship. Researchers – benchmark guidelines for effective community involvement. Funders, policy-makers and lecturers a resource for defining good standards in community research. 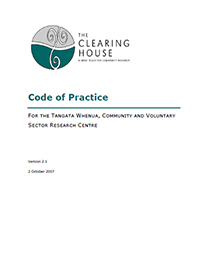 The Community Research Code of Practice (2007) provides benchmark principles and standards for undertaking community research, as described by researchers and leaders from community, government and academic sectors.